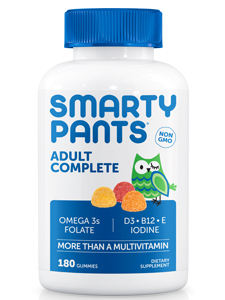 Here’s something else that will make you feel great: with your purchase, SmartyPants will make a 1-for-1 matching nutrient grant to a child in need through our partnership with Vitamin Angels. Directions: For adults, take 6 gummies daily. May be taken with or without food. Other Ingredients: Organic Cane Sugar, Organic Tapioca Syrup, Gelatin, Pectin, Citric Acid, Natural Flavors, Colors from Natural Sources (Organic Black Carrot Juice Concentrate, Annatto and Organic Turmeric). Contains Fish (Anchovy and Sardine). Sustainable Essential Omega 3 Oils are derived from these sources. Take only as directed. Do not exceed recommended dosage. If you have a medical condition, are on medication, or are pregnant or nursing, please consult a physician before using. Store in cool, dry area out of reach of children. Natural colors will darken over time—this does not affect the potency of the product. Do not use if safety seal is broken. 33 points will be rewarded to you when you buy this item. Earn free products. Click on the green "i" for more information on our rewards program.